It’s a Wrap ~ The 2014-15 service year, that is! The 2014-2015 year for the Huntsville JSL is all wrapped up, and we are pushing forward into a new year with new opportunities! We look forward to serving the community of Huntsville in the next year and for many years to come! Congratulations to our newly sustaining members Susan Cason, Molly Davis, Heather Johns, Sarah Mallory and Morgan Newman! Thank you for your many years of service and leadership to the league! We will strive to fill your footsteps and continue the good works that you have helped to build. Also, congratulations to our end of the year award winners: Amy McCormick – Founders’ Award, Christy Atkins – President’s Award and Denise Winston – Provisional Award! Thank you to Laura Dougherty for serving as our President over the last two years. She has done an outstanding job of leading the ladies of the league to influence our community in many positive ways. Her dedication to the league has been inspiring and greatly appreciated! Also, thank you to the executive board, especially outgoing board members- Cameron Klepac, Paige Loft, and Shelby Cadwallader for all the hard work in keeping the league in great working condition! The final newsletter of the 2014-15 service year is now available and has been sent to all sustaining members. 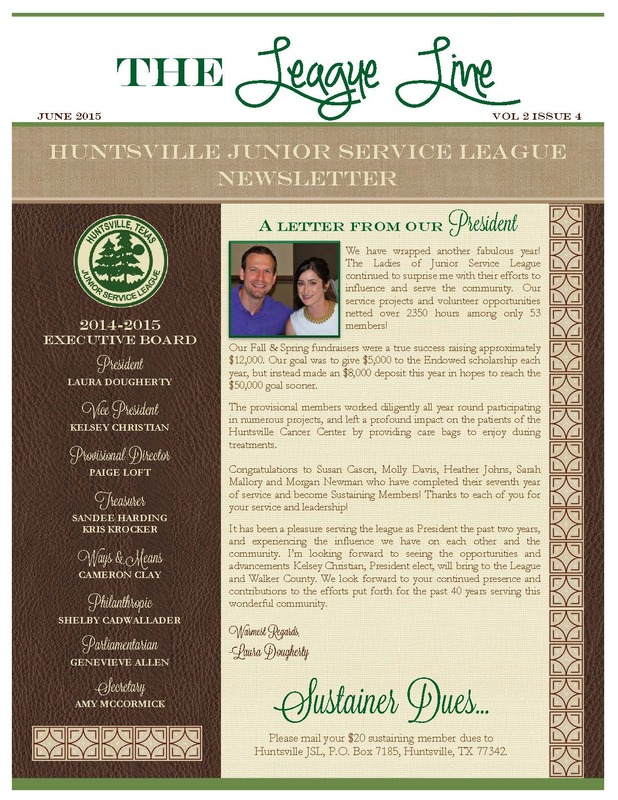 If you did not receive a copy, please send your email address to jsl.huntsville@gmail.com and we will add you to the list for future digital editions.